So yesterday was the Sun City Craft Beer festival. It was very fun, and lots of beers were consumed. I really didn’t think I’d be up for writing a review today, but I woke up nice and early ready to tackle the day. That being said, my choice for review is a cigar that I have been smoking quite a bit of lately, the Tatuaje 10th anniversary Belle Encre. The Good Stuff: It’s hard to believe that it’s only been 10 years since Pete Johnson entered the cigar market. 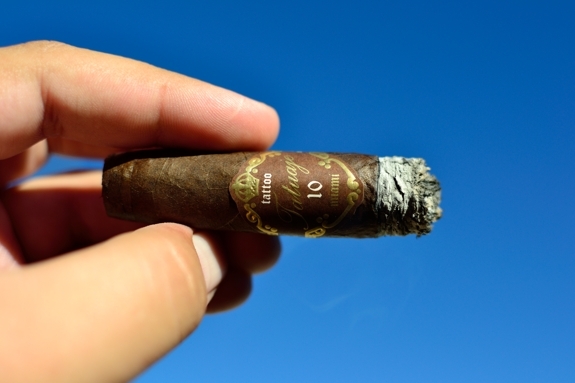 This cigar is made to celebrate his 10 years of premium cigar stardom. To celebrate, Pete decided to re-release the cigar that made him famous, the Brown Label. With the same basic blend Pete released two special sizes to celebrate. 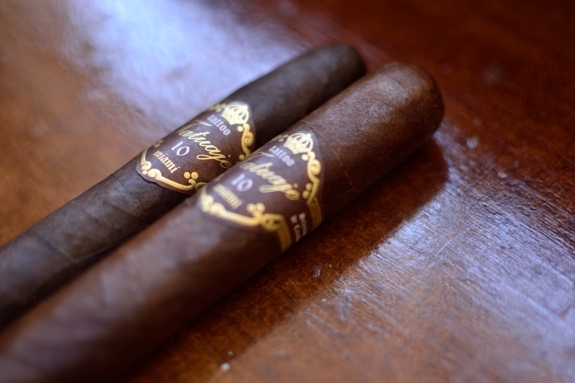 The 10th anniversary comes in two sizes, the Belle Encre which is a 5 3/8 x 42 perfecto and the Bon Chasseur which is a 5 3/8 x 52 Robusto which carries an unfinished foot. 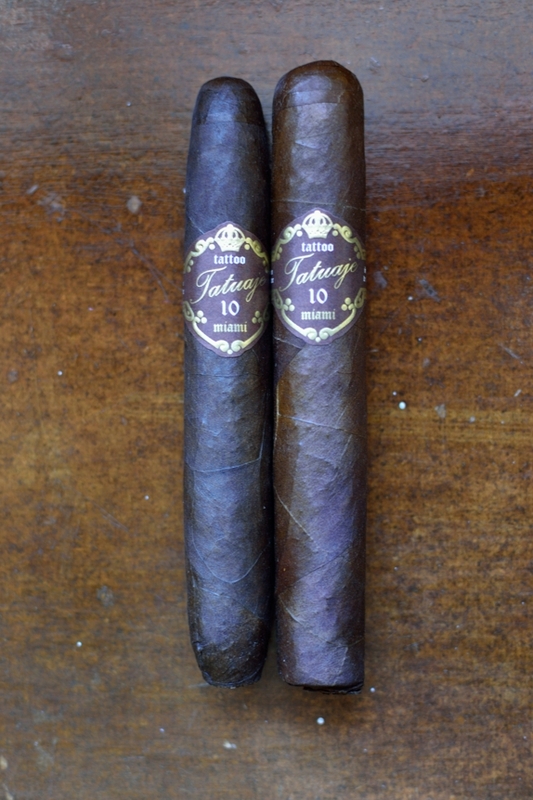 These two sizes also get a packaging update replacing the simple brown Tatuaje band with a meatier, brown gold and white band with the words “tattoo” “Tatuaje” “Miami” “Seleccion de Cazador” and “10” on the front”. The 10th anniversary will be produced at the My Father factory in Esteli, Nicaragua vs. Miami where the brown label was usually produced. The 10th anniversary comes packaged in boxes of 20 and run $10 per cigar. There is also a TAA 2013 exclusive format called the Gran Chasseur which is a 6 3/8 x 54 perfecto and it runs about $11 a stick. I got these over at Bonita Smoke Shop. Again, if you haven’t checked them out, you really should. Amazing selection, amazing prices, and the best customer service around. 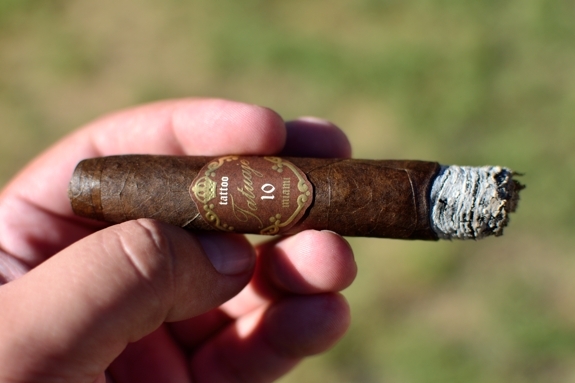 Prelight: Tatuaje’s 10th Anniversary Belle Encre carries a crazy dark wrapper. If you look at the side by side wrapper you can actually see a huge color difference between the two. It’s not necessarily the difference in size that causes that, it’s simply the difference of contrast across the wrapper leaf chosen for the blend. The Belle Encre starts with a tapered little foot that quickly expands into the 42 ring gauge. The wrapper carries a lot of medium sized veins as it reaches up to the tapered, triple cap. The wrapper itself screams of reflective oils with some slight tooth. The cigar as a whole is very hard and well packed. I couldn’t find a single soft spot. 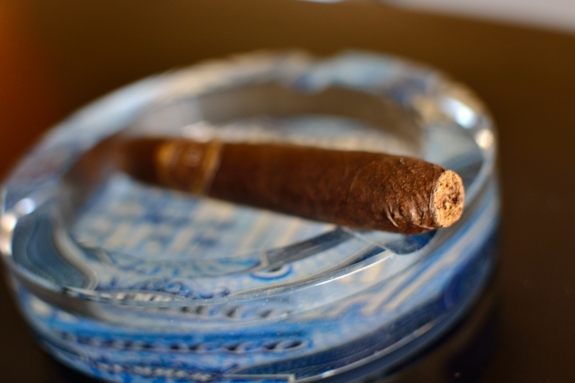 The wrapper gives off a whole ton of spice and pepper aromas while the foot of the cigar carries a bit of sweetness with some more spice and tobacco scents. The cap cut very clean and easy with my Palio double bladed cutter. The cold draw was really spicy with some awesome sweetness, and syrupy flavors mixed in. First Smoke: As predicted, the Tatuaje 10th Anniversary Belle Encre started out with an explosion of spice and black pepper. Once the pepper began to fade off some really sweet tobacco, molasses, cedar, leather and lots of spice were showcased in the first third. The cigar lit up with ease using my single flame butane torch. I feared for a bit that the draw would be tight due to how much tobacco was packed into this little cigar, but it was spot on kicking out just the right amount of thick smoke with every little puff. 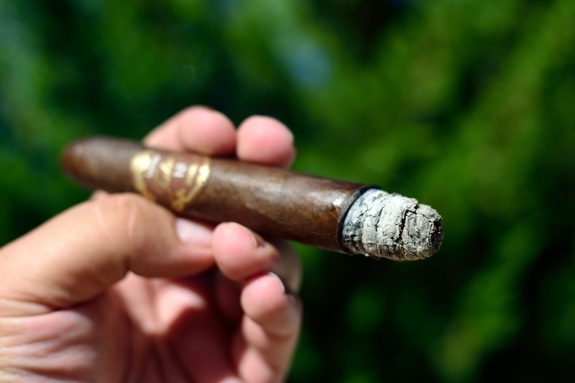 Usually I get crappy burns through the first third of perfectos but the 10th anniversary is rocking a razor thin edge and a flawless burnline leaving behind a trail of brilliantly white, and light gray tightly compacted ash which held of for about an inch before falling into my ashtray. Halfway There: The pepper took a bit, but it has finally completely fizzled out of the 10th anniversary. The sweetness is still rocking hard as well as the molasses as some nice, sharp, cedar has crept in with just a faint leather on the aftertaste. The retrohale is incredibly spicy and very sharp. It’s not very easy so I only found myself doing it once or twice to get the flavor from it. The burnline has a very larger waves that don’t really concern me and I am feeling almost no nicotine as I close out the second third. Finish: Into the final third there is a note I’d like to add. In each of the Belle Encre that I have smoked I got a little bit if sap/tar/whatever. You know, that really fowl tasting, brownish/black syrup we find on the cap of some of our cigars. Anyhow, I didn’t encounter this with any of the Bon Chasseur’s that I smoked and almost every time I do encounter it, it’s with a tapered cap regardless of the cigar’s make up or manufacturer. That being said, a little attention from my cutter clipping a bit more off the cap cleaned this right up and I was back to smoking cleanly in no time. Now into the final third of Tatuaje’s 10th anniversary the body of the cigar really ramped up. The flavor profile still carries a lot of sweetness and molasses but the cedar has become much more bold and there was a bit of a pine flavor as well as a ramp up in spice. It’s a great way to end a cigar. The cigar burned perfectly the entire way and required absolutely no attention from my lighter. Don’t let the size fool you, it still too me about 1.75 hours to take this little guy down. Overview: As always, the Brown Label delivered. I am always reminded of my first Tatuaje’s every time I fire up a brown label and just what it was that made me fall in love with Pete’s work. Complexity, construction, and great flavors while never really being over the top in terms of strength. The 10th anniversary Belle Encre is a great edition as the format delivers with lots of sweetness and spice. The price is right where you would expect it and will never leave you disappointed. While I wouldn’t go too far out of my way to find this size, It’s a great experience to those of us who really enjoy this blend. To Sum it Up: As always, this is a great cigar and is always in my regular rotation. 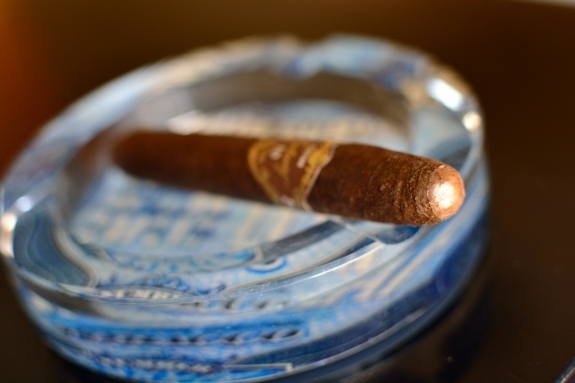 The 10th Anniversary Belle Encre didn’t stand out too much in comparison to other Brown Label blends, but the blend itself is complex enough to always satisfy the seasoned smoker overdoing it with the novice smokers. The price is nested right within the other formats in the brown label line. Box worthy by far. Pairing: Art of Darkness is a limited edition Belgian Style Dark Strong ale coming out of the Brewery Ommegang in New York. Ommegang has been a long time favorite of mine as it’s one of the only breweries in my opinion that specialize in Belgian style brews. This special beer was actually a birthday gift from none other than our Jeremy Henseley. He spoils me. Clocking in at 8.9% ABV this beer isn’t for the faint of heart. Leading off with a ton of fruit (cherry, apple, date) this beer is full of flavor. It finishes off with the traditional Belgian bitterness and a ton of malty goodness. 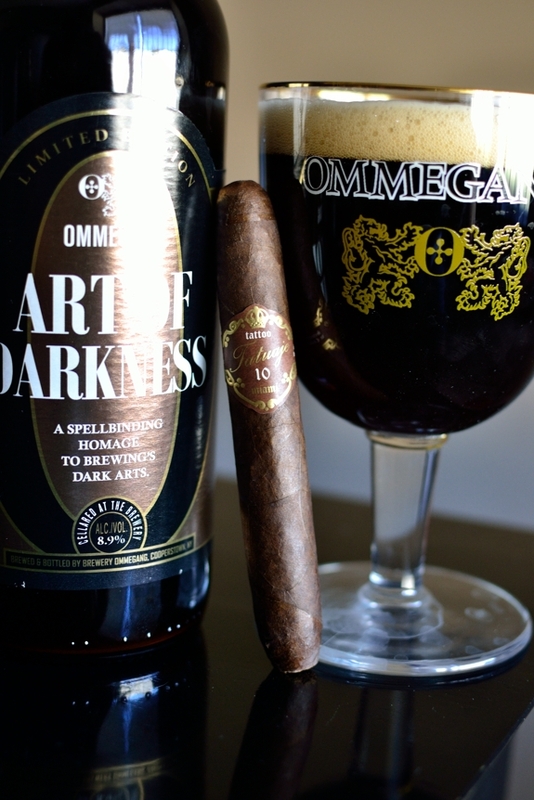 This beer is incredibly flavorful and could easily overpower most cigars. 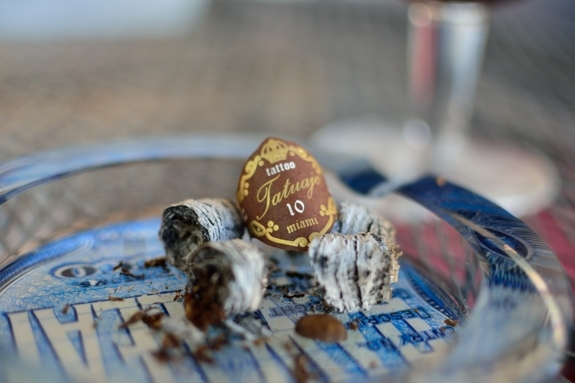 Lucky for us, Tatuaje’s 10th Anniversary can hold its own. The strong spice was from the cigar was an amazing addition as it parried up with the fruit and bitterness from the beer. Another great matchup was the molasses from the cigar as it transitioned into a much more malty, caramel mash up with the beer. Great Pairing, success! Ommegang is pretty easy to find in these parts so I suggest picking this one up while it’s still available. If I’m not mistaken, there was only one run, so there won’t be much to go around. LOL, the cigar sounds tempting (just had a 7th about a week ago), but man, I really want that beer! I take it that it’s quite a bit more expensive than their regular lines? Sorry bout that, using a tablet n not used to it yet. Good review and I’m liking your background shots of late. It showcases the stogies well, forcing your focus onto the sticks more. Well besides being a Tat Brown label, the size immediately caught my eye. Despite the draw issues & burn sometimes associated with perfectos’, I’m still a sucker for their hand & mouth feel, I have also found the sap/tar issue with the tapered shape of the last third of some perfecto’s. Do you think shape a valid reason? I would like to see your take on the Bon Chasseur..
Not being a big Pepin pepper blast kinda guy, would you say the flavor is in your face? I aged some Seleccion De Cazador’s for a couple of years and the time really smoothed out some of that harsh in your face spice. That’s the great part of putting down a worthy box to rest, and comparing it to when it was younger. But, as I get older delaying gratification becomes harder. I think the shape may have something to do it with it, but I am not sure. Maybe we have to draw a bit harder to get the smoke we want? Not sure, either way, it;’s annoying. The Bon Chasseur smokes almost identical but to me, had a bit more sweetness and a more creamy experience. I think the flavors stood out more in the Belle Encre though.